Happy Cinco de Mayo! Whether you are hosting a brunch or preparing for a Mexican fiesta tonight you will want to make my Cherry Tomato and Chorizo Omelet’s! Or, if you aren’t the Cinco de Mayo celebrating type of person you can serve these up on Mother’s Day. This week I’ll be participating in Brunch Week. A week of delectable brunch-recipes from a wide-variety of food bloggers (31 to be exact)! Today, I’m sharing what I like to call a 2-for-1. This hits both Cinco de Mayo and Mother’s Day! I recently had the opportunity to try out some OXO egg kitchen tools. 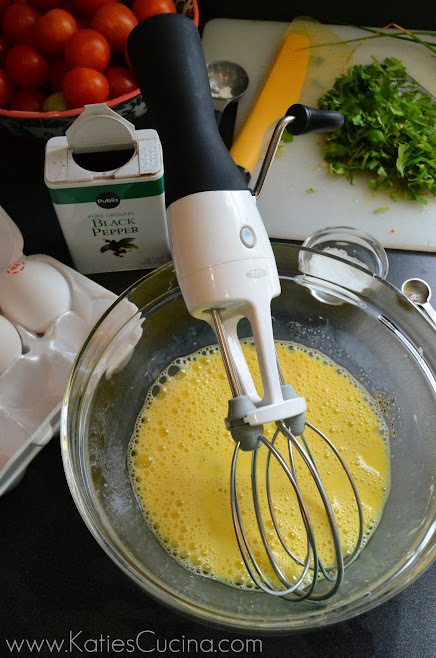 Pictured above is the OXO Good Grips Egg Beater. I shared with the world 2 years ago how much I love this egg beater and how easy it is to use. Check out my How to Cook Fluffy Scrambled Eggs post. It was my first cooking video I ever made, too! Whenever I make eggs I have to use my egg beater. I had been brainstorming about a brunch related recipe to share for the past few weeks. Last weekend, we had our first-ever community garage sale. I knew this would be the perfect time to make an omelet recipe and have a few of my favorite neighbors test it out. Like I mentioned the other day I have an abundance of cherry tomatoes. I knew I would have to incorporate cherry tomatoes into the omelet. I reached into my pantry and found a package of chorizo and at that same moment found myself gazing at a few limes I had in my fruit bowl. I knew I was going to make a Cherry Tomato and Chorizo Omelet. Before I got started, I walked out to my garden and clipped a generous bunch of cilantro and a handful of chives. I prepped all of my ingredients before hand so cooking my omelets would be a breeze. That is the key when your cooking omelets or really just about anything. If you do all of the prep work in advance the cooking part won’t be as dautning. You won’t burn nor over cook anything because you aren’t worried about chopping, measuring, and dicing. Pictured above is me showing off how easy it is to use the OXO Good Grips Flip and Fold Omelet Turner! I love this new spatula! 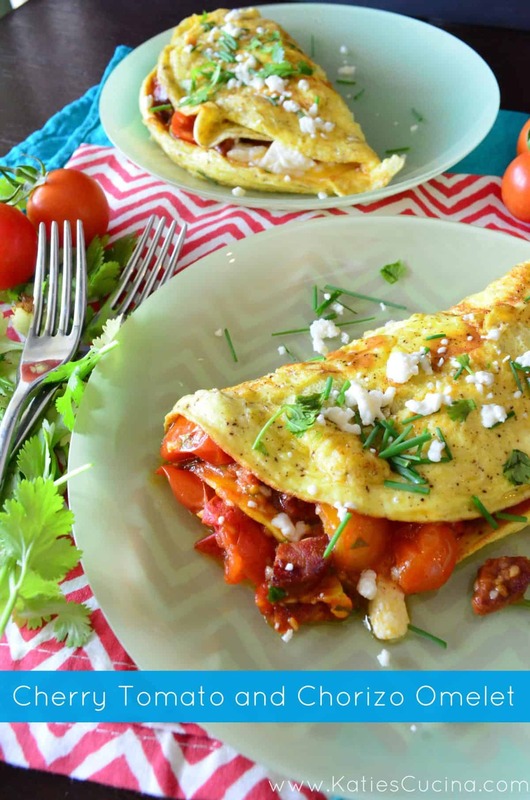 So whether you are celebrating Cinco de Mayo today or just starting to plan for a beautiful homemade mother’s day brunch give my Cherry Tomato and Chorizo Omelets a try! Crumbled Queso Fresco, cilantro, and chives for topping. In a medium sauce pan, add one tablespoon canola oil to the pan (medium-high heat). Then add quartered pieces of chorizo. Cook for 2 minutes then add 2-1/2 cups cherry tomatoes, jalapeno, garlic, and salt. Cook on medium for 5-10 minutes. Add lime juice and stir in cilantro right before serving. Once the cherry tomato-chorizo mixture is almost finished cooking begin to cook the eggs. I made my omelette's in 2 batches using 2 small frying pans. In a small frying pan add one-tablespoon of unsalted butter (medium-high heat). While butter is melting beat 4 eggs with 2 tablespoons of half & half (*if you don't have half & half use milk--that's just what I had on hand). Add 1/4 tsp of salt and black pepper. Beat well until bubbles start to appear in egg mixture (about 15 seconds). Divide the egg mixture in half among the two frying pans. Cook on medium heat for 2-3 minutes until eggs have set. Carefully flip the egg over, cooking 30 seconds more. Place 1/4 cup of tomato/chorizo mixture on one side of the omelette as well as 2 tablespoons of queso fresco cheese. Flip the egg to form an omelette, and carefully transfer to plate. Repeat this step until all of your omelette's are done cooking. Top with additional crumbled queso fresco, minced cilantro, and green onion. And of course… don’t forget to enter the Brunch Week Giveaways!!! Disclaimer: OXO sent me the egg kitchen tools to try out. I was not compensated nor required to blog about it. I love OXO and use their products on a daily basis in my kitchen. There are affiliate links in this post. All brunch week sponsors are providing prizes. I did not receive anything from the sponsors nor was I compensated to write about them. As always all opinions are my own. ooo Katie, you’re right, this is a fantastic recipe! 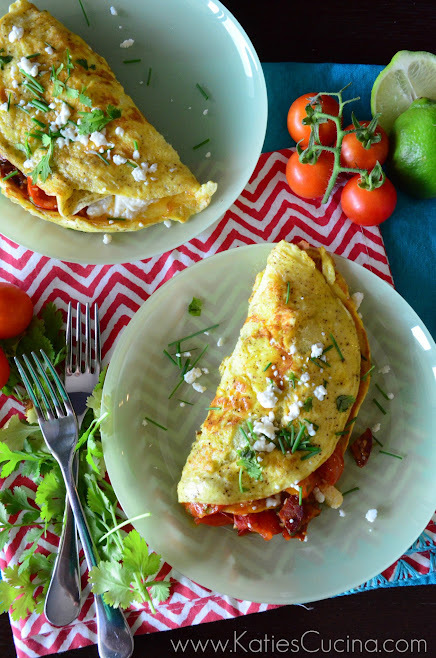 I love Chorizo – never thought to use it in an omelette. Happy Brunching! I love chorizo, and never thought to put it into breakfast/brunch recipes. This looks so good! Thanks Suzanne! I know I love the idea of switching up the traditional breakfast recipe! Thanks Carrie! Seriously, the egg beater is one of my favorite kitchen gadgets!!! Oh that omelette looks so good & I have got to get one of those omelette turners! Thanks Ellen! It really does help when making omelets! My husband thought it was yet another kitchen gadget but after he watched me make omelets he realized it is necessary! Oh how I love chorizo! I’ve never putit in an omelette before. Brilliant!!! Christine, you should definitely give this recipe a try then! Crumbled Queso Fresco… Must buy ASAP. I love Omlettes. Can’t get enough of them. lol yes! queso fresco is key to making Mexican food a little more authentic. Mild like mozzarella yet a tad bit softer. It is sold as a solid circular block of cheese. As soon as you cut a piece you’ll see it crumbles beautifully! I love the colors in this recipe–I always feel more compelled to eat things when they’re bright and colorful. Then again, I love omelettes, so I’m easily persuaded 🙂 Great combo! Mmmm…more chorizo. Must use it in breakfast food soon. Its so funny how so many of us used chorizo! I partly blame it on Cinco de Mayo! This looks delicious! Thanks for sharing! !